As regular readers know, I’m a huge fan of using the Picture Word Inductive Model (PWIM) as a primary instructional strategy for Beginning English Language Learners. The image illustrating this post is an example of what one might look like using the PWIM. I’ve also written more extensively about it at The Best Ways To Use Photos In Lessons. Even though it’s a great strategy, it’s also possible to have too much of a good thing. In other words, if you use the same strategy week-in-week-out, with no variation, it’s eventually going to feel stale to teacher and students alike. I think it’s important, however, to follow the process I laid-out earlier in this post pretty religiously for a couple of months so that students really “get” it. After that time — in fact, just about at this time of the school year — it’s time to change it up a bit while still sticking to the general outline. I thought it would be useful to share some of the modifications I’ve made in the past and also invite readers to contribute their own. 1. After the first stage of labeling the image (which is always tied to a theme — home, food, etc. ), ask students to find a similar thematic image online and use one of the numerous new online tools that let you mark-up images so that they look just like a PWIM photo. Students can use the same words and identify new ones, too. My favorite tool for this purpose is Szoter Online because no registration is required, but Thinglink is another viable option. Students can post and share their images on a class blog like ours. 2. Have students come up with questions they have about the image — both literal and interpretative (the teacher should provide some question “stems” like the ones on page two and four in this document). Students could share all their questions and then categorize them — perhaps into “literal” and “interpretative” — and develop more questions that would fit into them. As a follow-up speaking activity, students could take turns asking each other some of those questions and coming up with potential answers. The teacher could also use slightly different version of this modification by creating a series of questions with sentence stem answers (like this one) that students could complete for one image and then use as a model for future ones. 3. 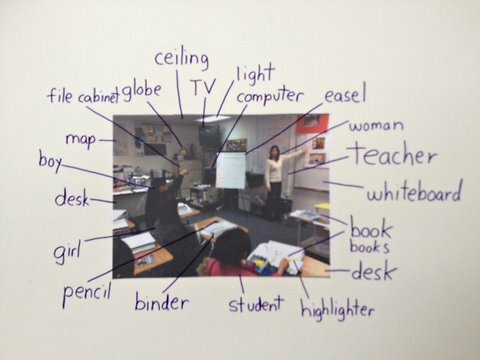 Instead of providing students with a series of one sentence “clozes” about the image that students have to complete and then categorize, have students use the words to create their own one sentence clozes that they share with their classmates. Then students categorize those sentences. 4. Instead of just having students add new words to categories, have them create a picture data set — either online or with images from old magazines. In Picture Data Sets, students add new words, along with words that describe them. One way to do this online is with the many virtual corkboard tools available, with Padlet being the most well-known. I have to say, though, that I’ve been finding all them rather clunky these days, and think the easiest way for students to create them is to copy and paste images onto a Word document and then create a webpage out of them using Txtbear — it really doesn’t get much more simple than that… Students can then post the link on a class blog and share them. 5. For newcomers, I just have them string together the sentences they write about each category into a paragraph — I want them to begin to gain an understand of basic writing structures and the fact that a paragraph focuses on one main idea. As they began to gain more language fluency, instead of individual sentence clozes, students can be given teacher-created whole paragraph clozes (Wendi Pillars has a good example on her blog. Her same post includes other good ideas for modifying PWIM lessons). Along with that idea, teachers can make similar clozes for introductions and conclusions as models that students can eventually write entirely on their own. 6. As an “add-on” step, teachers can find a comparable photo to the main one, have students label those words, and then create Venn Diagram and ultimately a compare/contrast essay. I’ve given an example here. Also, read Finding Similar Images To Use For Compare/Contrast Prompts. 7. An idea that one of my student teachers tried out and seemed to work well was having students develop a conversation that people in the picture might have — using the vocabulary words they were learning from the picture. 8. A bilingual aide in my classroom came up with the idea of showing two pictures on the same topic (inside a grocery story and at a fruit and vegetable market); have students create a Venn Diagram comparing the two, and then have them categorize words and sentences based on the Venn Diagram. I’m sure there are a zillion other potential modifications, so I’m all ears! I was trained by Emily Calhoun and Bruce Joyce…you can use PWIM every day without it becoming stale…You just need to know what to do with it. Can you clarify what you mean by having students “categorize the sentences”? I think this is an awesome strategy to use in my class, but I’m not sure what to do after having students brainstorm words and complete the clozes. Can you provide an example of how you have them categorize sentences? Reviewing my “best” list on inductive learning and/or reading my books are resources to find step-by-step instructions.